The College of Notaries Northern Ireland is the professional body of those solicitors practising as Notaries Public in Northern Ireland. This website provides information to the general public and to the rest of the legal profession about notarial practice and procedure in Northern Ireland. The Law Society of Northern Ireland represents and regulates the solicitors' profession in Northern Ireland with the aim of protecting the public. The Law Society is the professional body for solicitors in the Republic of Ireland. The Legal Services Commission provides legal aid to help those eligible obtain fair and equal access to justice in Northern Ireland. Action against Medical Accidents (AvMA) is the independent charity which promotes better patient safety and justice for people who have been affected by a medical accident. Co-Ownership is a Do It Yourself Shared Ownership scheme (DIYSO) exclusively for Northern Ireland. If you hope to own your own home but can't quite afford it, Co-Ownership may help you onto the home ownership ladder. The Vaughan Trust is a charitable trust that exists to support the development of agriculture in County Fermanagh. Further details can be found on the Trust website. The funds are administered by a board of Trustees. Go to the Trust website for further details of available schemes and funding opportunities. 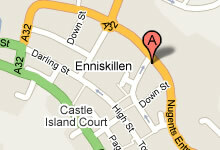 Web Design Company Based in Fermanagh. Providing a complete range of design services and smart phone application development.